JOSH Corner is feeling happy and confident about the rest of the 2014 Motorpoint British Supersport Evo Championship season after a successful second round at Oulton Park. 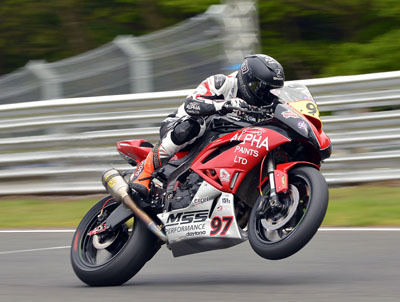 The South Shields teenager arrived at the Cheshire circuit trying a brand new set-up on his Alpha Paints LTD/MJJ Motorsport Kawasaki, and planned to use the weekend as a big test session as he got to grips with new parts. After qualifying 11th in class for Sunday afternoon’s race, the 17-year-old got a good start and was beginning to make progress through the field when his steering damper wound off after Lap Two. Determined not to give up, Corner pushed on and made his way up to finish eighth in Evo at the chequered flag. Happy with the progress made, Corner was feeling much more confident ahead of Monday’s feature race. But disaster struck moments before the team was ready to leave the awning, as they were hit with fuel problems. “It was a good weekend, I’m really happy with what we achieved, it’s just a shame the timesheets don’t reflect it,” he said. “We had a lot of new things to try and by the end of the weekend I was pleased with how everything was working for me.